Soluble in ether and acetone. Very soluble in benzene. Slightly soluble in carbon tetrachloride. 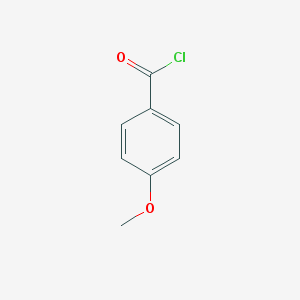 4-Methoxybenzoyl Chloride is used in the synthesis of stilbene and dihydrostilbene derivatives as potential anti-cancer agents. It is also used in the synthesis of coumarin dimers with potential HIV-1 activity.